Hey everyone! It’s mid-week, and it’s pie time. I don’t make pies that often, and there’s a reason- it’s just a lot of work. Truth be told, I really am not a huge fan of recipes that involve rolling something out, and that includes pie crust. It is what it is guys. But today, I gotta say, this pie is too good to not share. And I’m using a couple of shortcuts along the way to make that pie life a little bit more manageable. The first is, you guessed it, store-bought pie crust. I have a wonderful pie crust recipe that I love, but listen. I’m just not always ready to do the whole shebang. You guys get it, right? Right. So today we’re using that refrigerated, rolled up crust, and it’s legit really, REALLY good. The other major shortcut I’m using here is canned dulce de leche. I’ve made it myself a few times, and it’s really good, but the canned stuff is really good too you guys. And more importantly, making it from scratch takes a LONG time. Even recipes that just use straight sweetened condensed milk usually require that you cook it for 3+ hours. It’s too much! We just want pie! 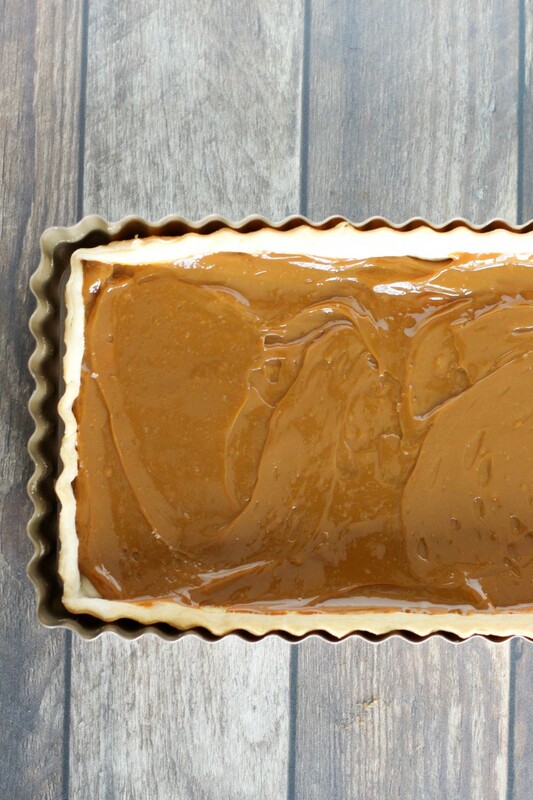 One thing I do recommend is adding a healthy pinch of salt to the dulce de leche before spreading it into your pie crust- it goes a long way. So, here’s how things come together on this one. First up, roll the crust into an oblong shape that fits into our rectangle tart pan. You can definitely use a round tart pan as well here, totally doable. Then, we’re blind baking the crust until it’s completely cooked. You will absolutely want to line the crust with foil, and then fill it with the pie weights of your choosing- either pie weights, beans, rice, or even sugar (it becomes lightly toasty, and it’s really nice to use later). Up next is a healthy layer of our dulce. Spread it evenly in the bottom of your crust. 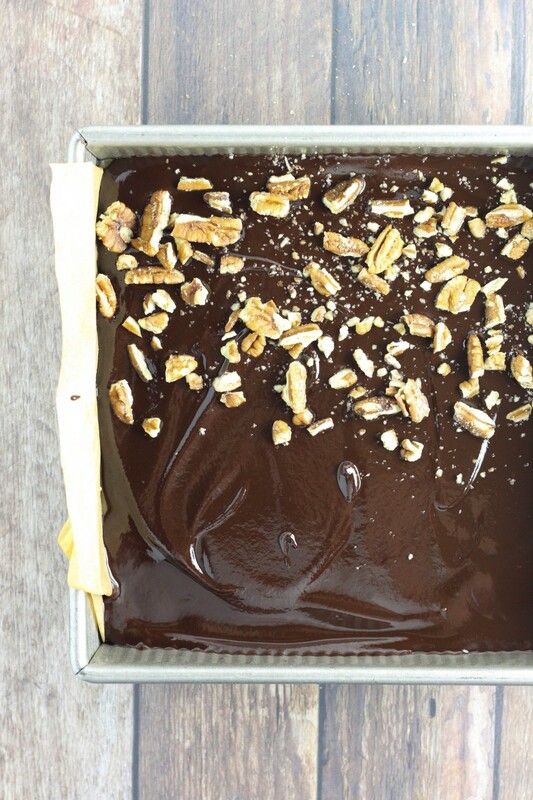 The dulce is thick enough that we can actually pour the chocolate layer right on top without any chilling. 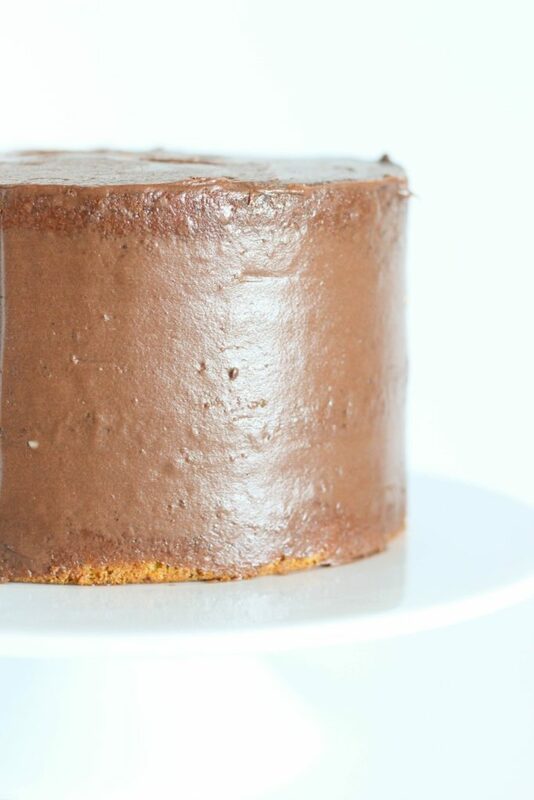 Onto that chocolate layer- it’s a simple ganache. 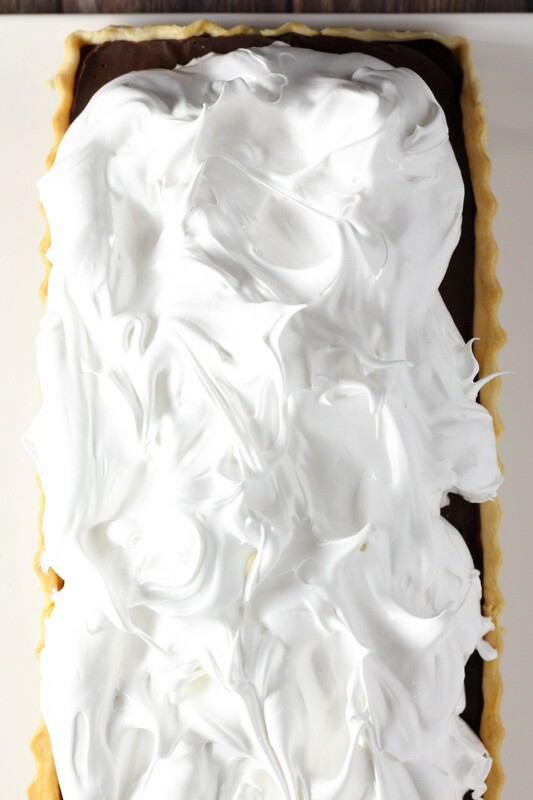 You’ll use bittersweet chocolate, heavy cream, vanilla extract, and salt, and heat it until super smooth and silky. Pour it over the crust, and chill for about an hour. In the meantime, we’re topping this bad boy with a Swiss meringue. You cook the egg whites and cream of tartar, and sugar over a double broiler, and then you whip it up slowly while it cools, until it’s some beautiful silky cloud of sugar. Add a bit of vanilla, and a pinch of salt, and heap it high on the pie. And then ya know, torch it baby! By the way, if you don’t have a torch, you can put under a broiler set oven, but keep a VERY close eye on it! 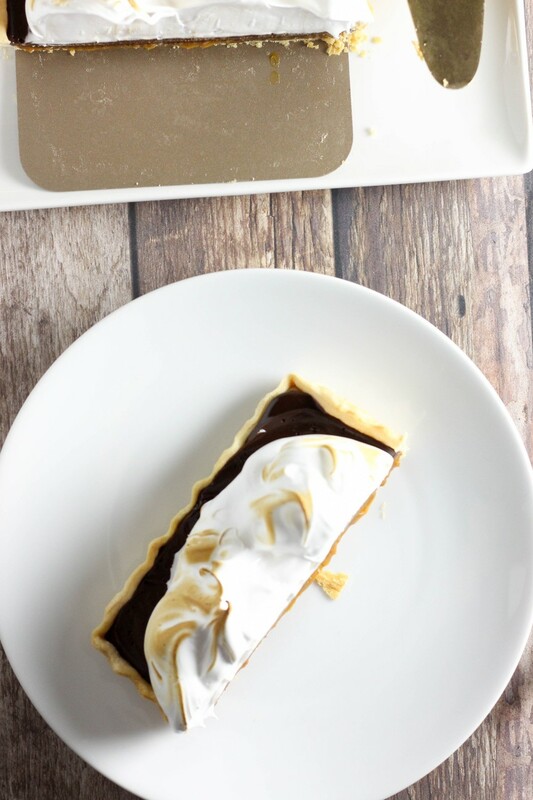 This is a very sweet pie you guys, it’s indulgent, and it’s totally worth it. Enjoy! In a small bowl, stir together the dulce de leche and salt until combined. 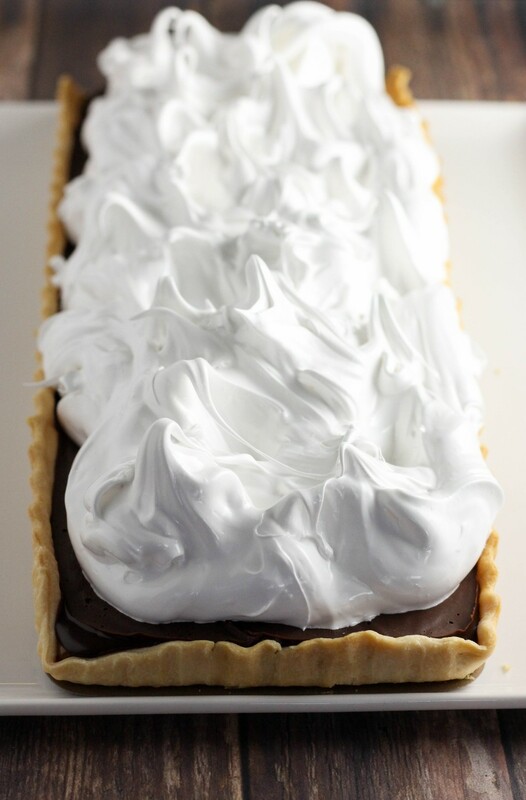 Spread a generous, even layer into the bottom of your cooled crust. Set aside. In a microwave safe, medium bowl, heat the heavy cream until boiling in the microwave. Pour in the bittersweet chocolate, vanilla extract, and salt. Let it sit for a couple of minutes to allow the chocolate to start melting, and then whisk until completely smooth. Pour over the dulce layer in the tart crust. 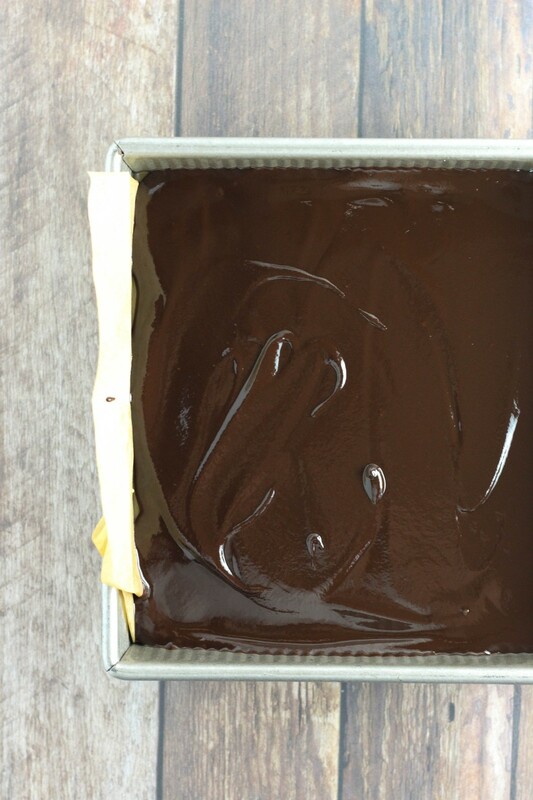 Cover with plastic wrap, laying the plastic directly onto the chocolate layer, and chill for at least an hour. In a large heat-safe bowl over a double-boiler, whisk the egg whites, cream of tartar, and sugar for about 5-8 minutes, or until the sugar is dissolved. Transfer to a stand mixer, and whisk on medium speed for 10-15 minutes, or until the mixture is cool, and has stiff peaks. Beat in the vanilla and salt. 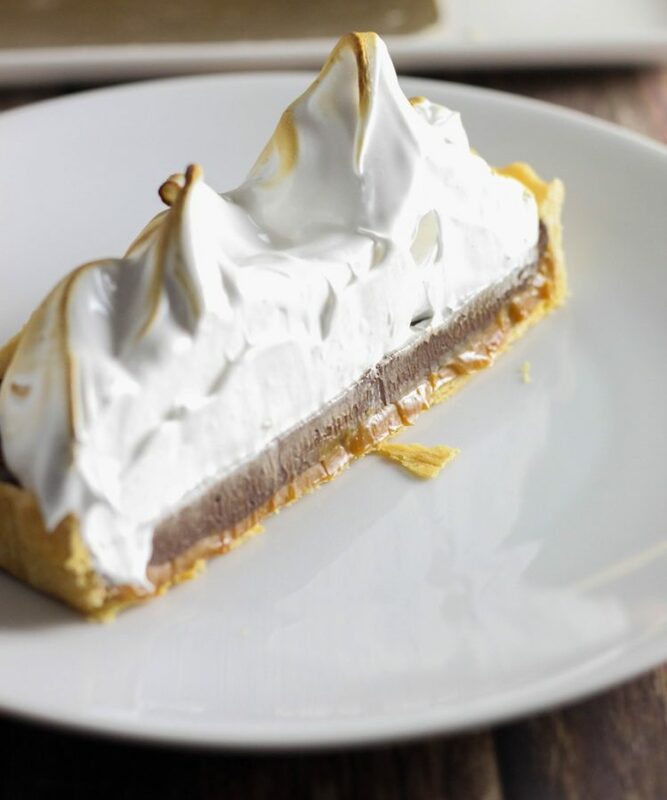 Pile the meringue on top of the chilled pie, and use a fork to fluff the meringue and create peaks. 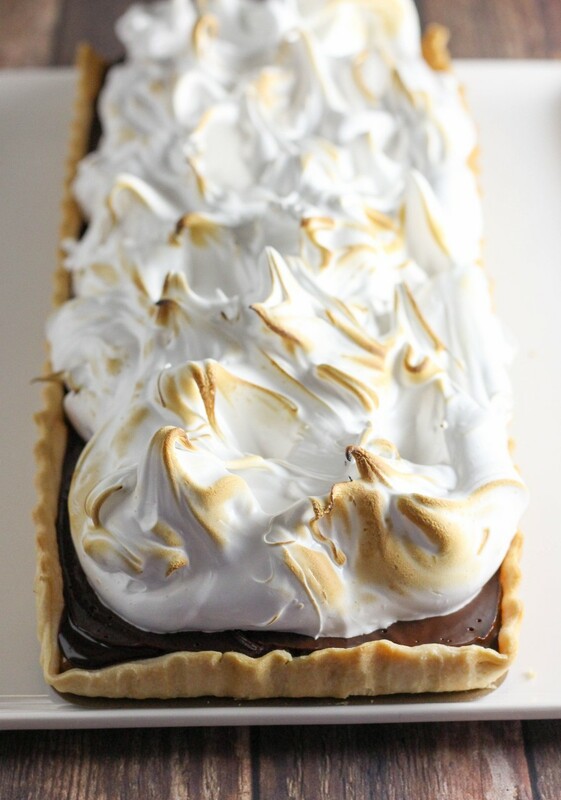 Use a torch to toast the top of the meringue, or place the pie under a broiler in the oven for 2-3 minutes until it has become toasted. Enjoy! Hey guys! It’s recipe day, and today we’re on muffins. These ones are filled with crushed Oreos and chocolate chunks, and topped with a crisp crumb, that, you guessed it, is also filled with Oreos. If you don’t like ’em, today isn’t for you! 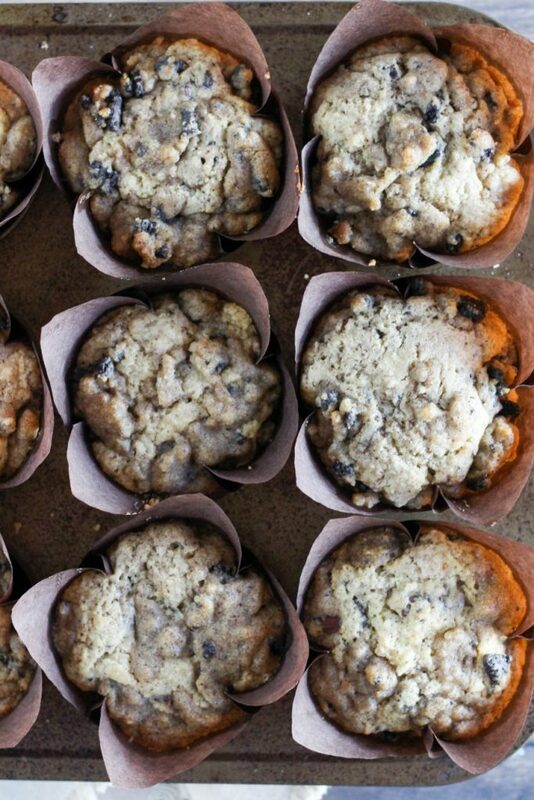 Alright so today I’m taking my classic muffin recipe and making it, well, better. I have no clue why I didn’t add sour cream the batter before, I always add it to things like this, but it really, REALLY helps things out. 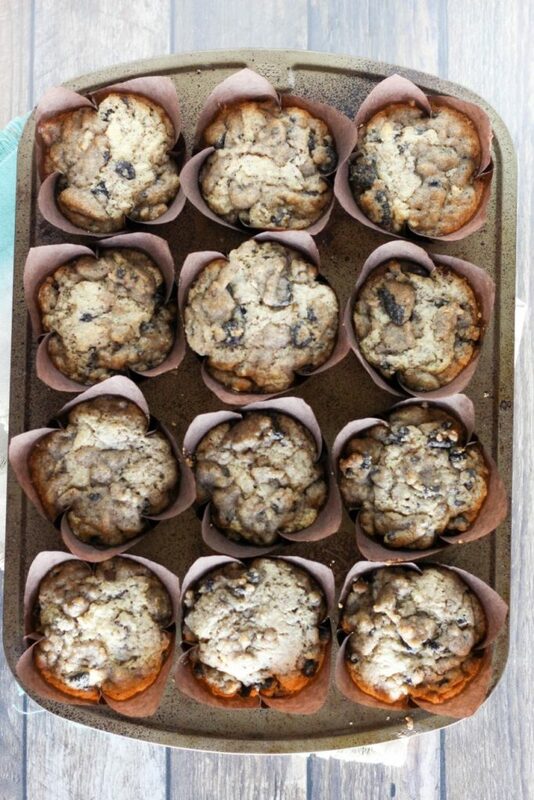 I think traditionally muffins just weren’t supposed to be as cake-like as they are now. But like, there’s a time and a place for dry baked goods (think biscotti… and… that’s all I can think of), but muffins? Let’s make them taste amazing. I mean, it’s not as though they’re healthy when they’re less cake-like guys. So anyways, here’s how this goes down. First, we’re mixing up the dry ingredients in a big bowl, and the wet ingredients in a small bowl, and then throwing them together. Before mixing them up though, add in the chocolate chunks and the crushed cookies. This allows them to get lightly coated in flour as you mix, and it helps to keep everything from sinking to the bottom. Then fold it all together. 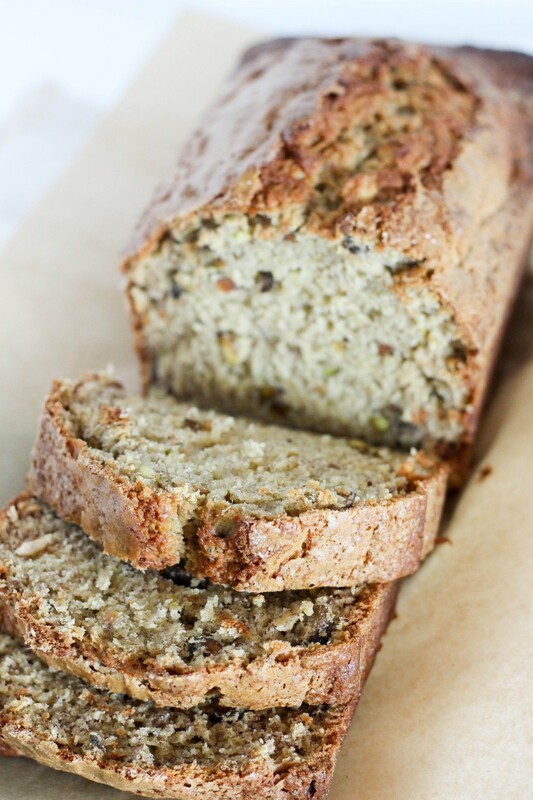 Now, this is important with all quickbread-type baked goods- DON’T OVERMIX! 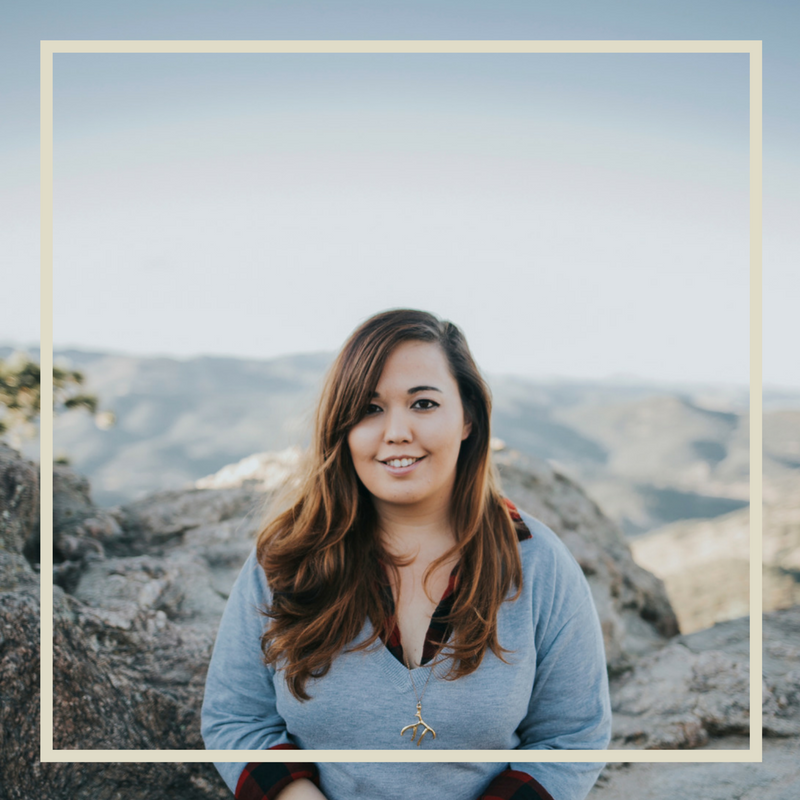 It’s going to be thick and lumpy, and that’s totally okay. If you beat it to death to get the batter smooth, you’ll end up with a tough, dense muffin. We don’t like those. 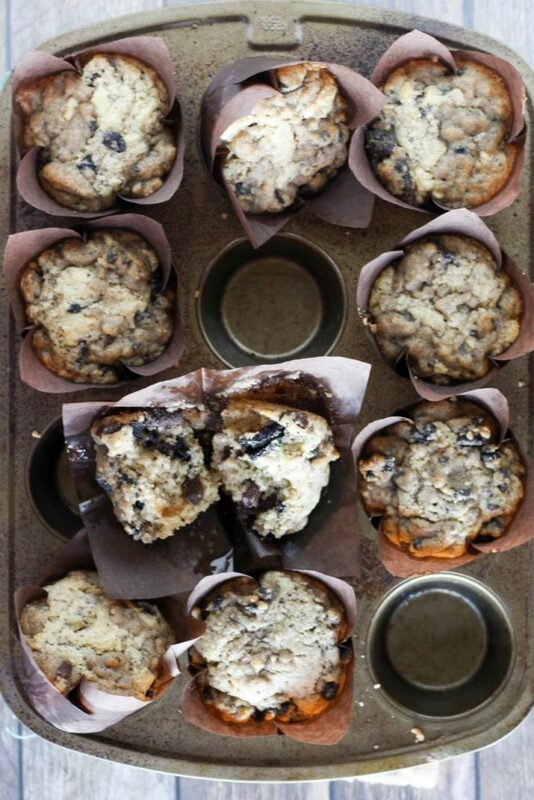 So then scoop it out into a lined muffin tin- we’re making 12 big ol’ muffins today. And we’re topping them with a beautiful crumb- it’s got turbinado sugar in it, which helps give us that crisp top. And more cookies, we talked about this right? You bake them up, and it’s too good you guys. I mean, and that’s not surprising considering what we’ve got going on in here. 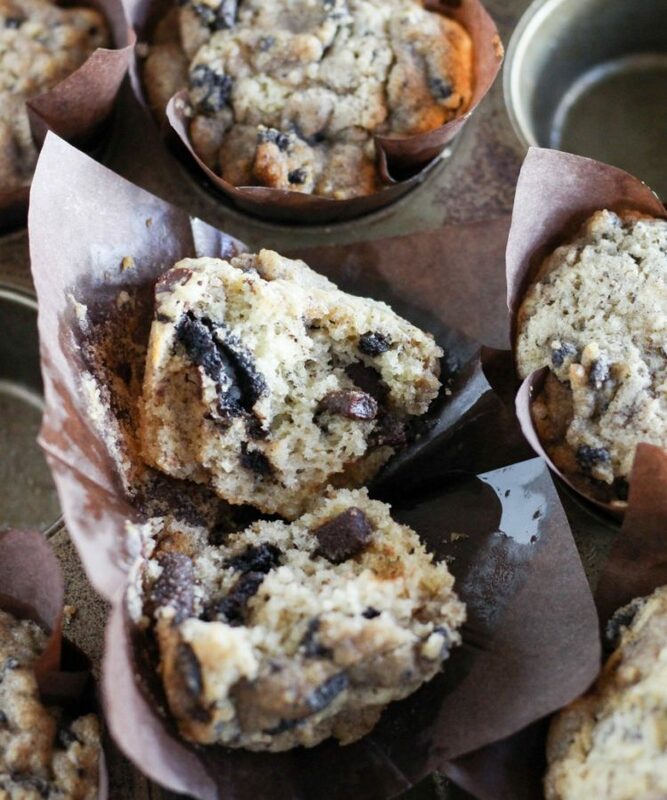 Bake these, eat them every morning this week, you deserve it. 1/2 cup shortening, room temp. Preheat your oven to 350 degrees, and line a 12 -cup muffin pan with liners of choice. Set aside. In a large bowl, stir together the flour, sugar, baking powder, and salt. Set aside. In a small bowl, whisk together the milk, vanilla extract, egg, melted butter, and sour cream until combined. Pour the wet mixture into the dry mixture. 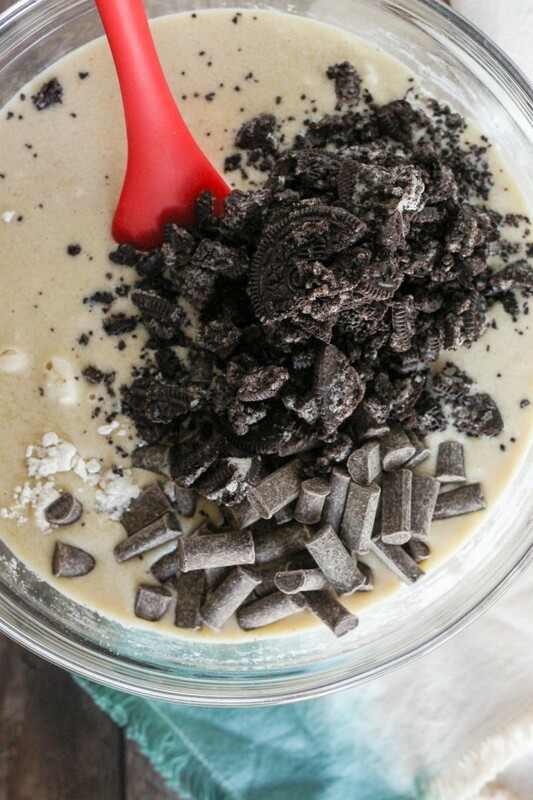 Add in the Oreos and the chocolate chunks, and stir the whole mixture together with a spatula until there are no dry pockets. Scoop the batter evenly into your prepared tin, filling each cup about 3/4 full. In a medium bowl, mix the shortening, honey, brown sugar, turbinado sugar, flour, Oreos, and salt with an electric mixer until completely combined- you should have large crumbs. 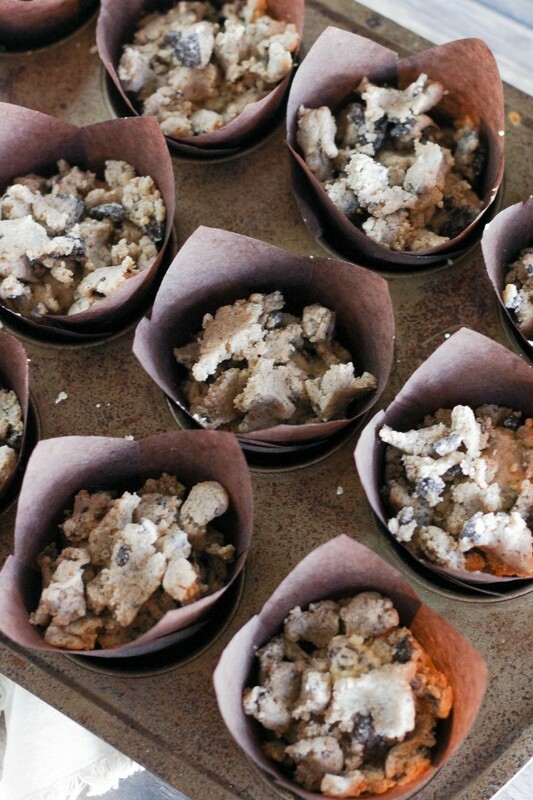 Evenly and generously cover each tin of muffin batter with crumbs. Bake muffins for 18-20 minutes, or until just golden. A cake tester should come out clean. Cool and enjoy! Hey guys! It’s Monday, and let’s make something, okay? 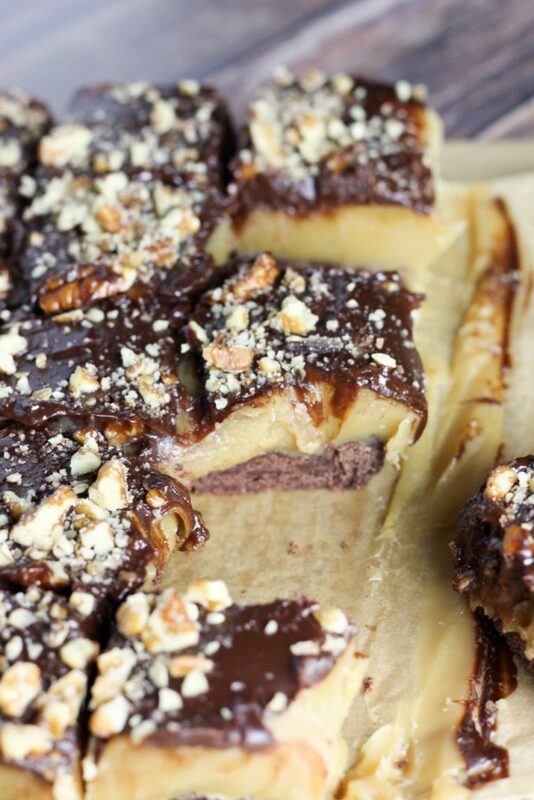 Today we’re talking about millionaire bars, which are a classic bar dessert. 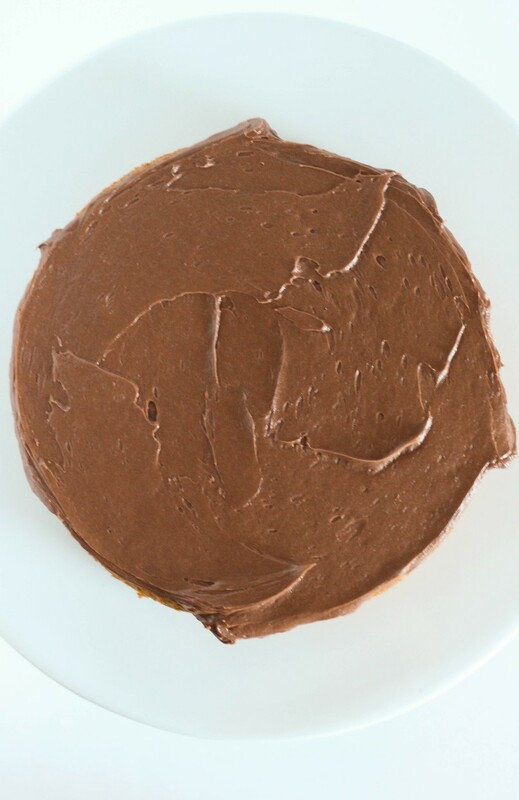 Here’s how it typically goes down: a base layer of vanilla shortbread, topped with a thick layer of chewy caramel, and capped off with chocolate, or chocolate ganache. It’s messy, it’s delicious, and it’s really sweet. So today, we’re giving it a little twist. First up, the shortbread base today is chocolate shortbread instead of the classic. It’s the beginning of the week, let’s all just get that much-needed treat in, k? 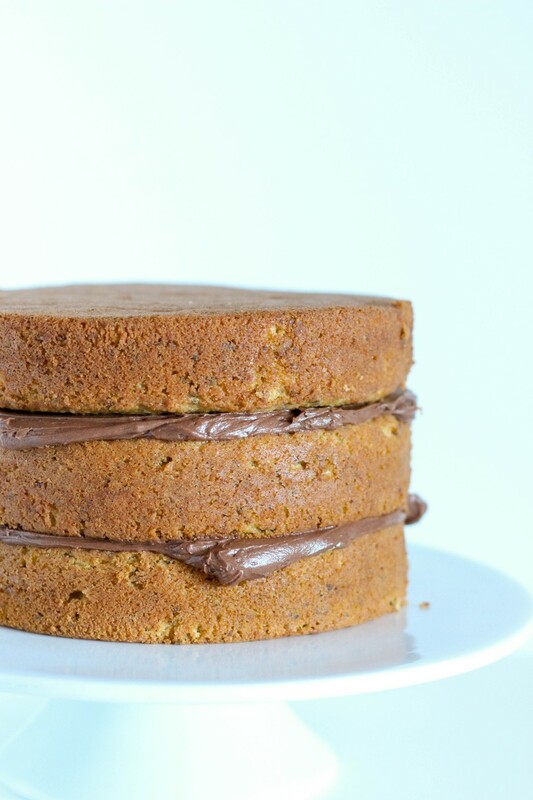 Now, we’ve got that trademark caramel layer, and it’s a thick one. Let’s be real, caramel is the star of a great millionaire bar. 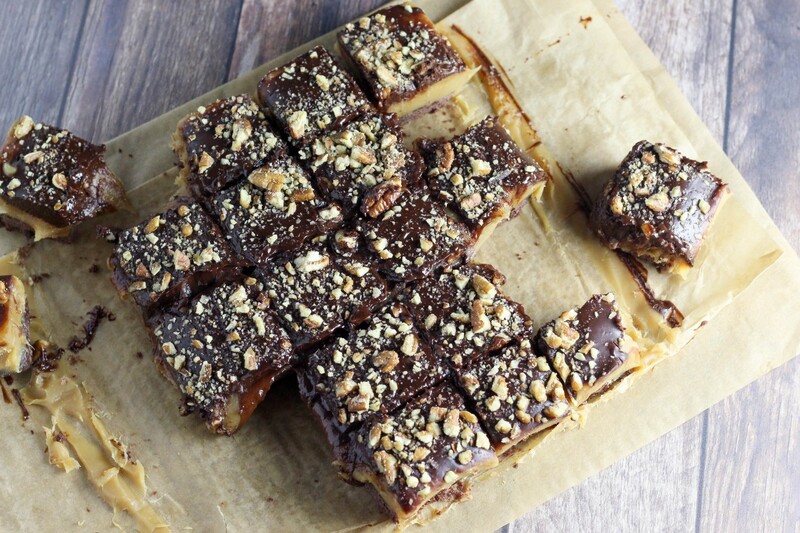 What I really love about this caramel recipe is that it uses sweetened condensed milk. Caramels that use condensed milk are WAY easier, and they are WAY harder to mess up. 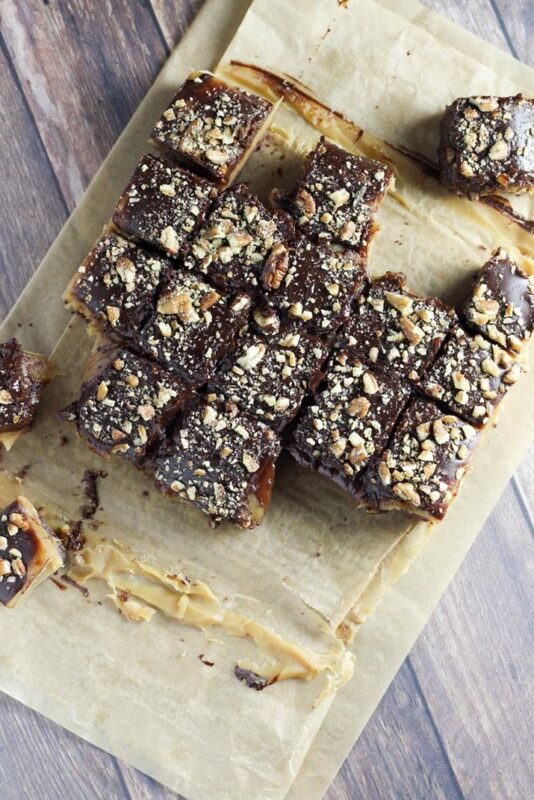 If you’ve ever tried making classic caramel, it’s no easy task. I would like to say I have figured it out, but the reality is that there are so many tiny factors that can mess up a classic caramel, it’s hard to really become an expert. 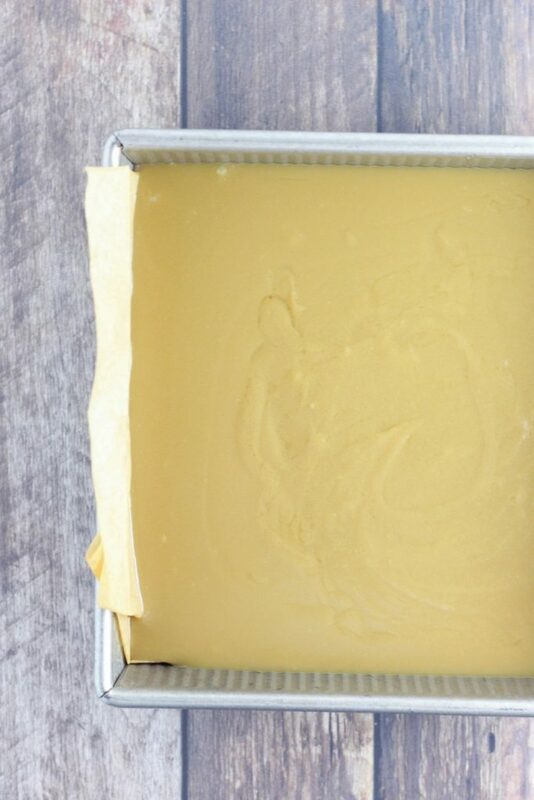 The condensed milk, combined with brown sugar, and the cooking method here- they all make for an easy caramel that comes out smooth, silky, and flavorful every time. It is, however, a bit of a labor of love- you have to stir it constantly for about 15 minutes. Worth it, I promise. 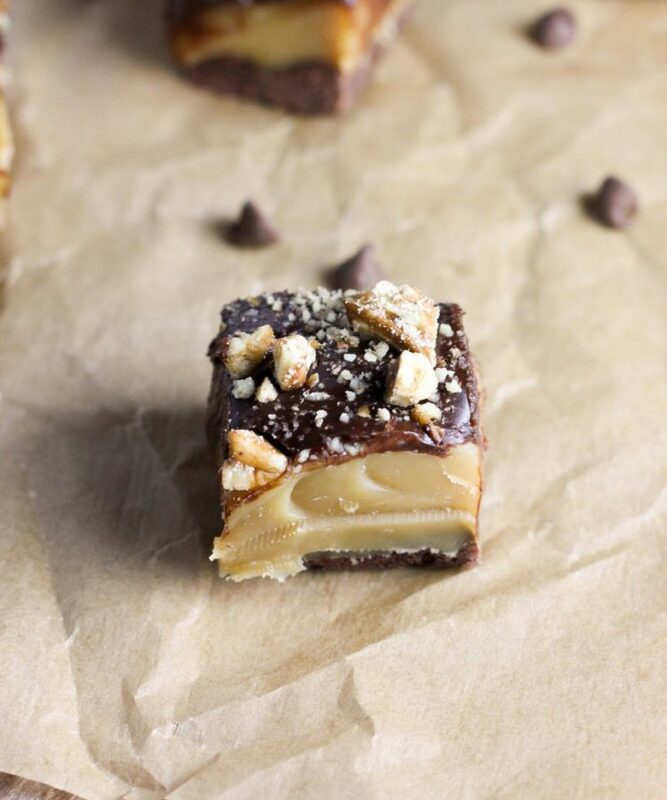 To combat the sweetness overload here, we’re adding a healthy dose of salt to our caramel layer, as well as the ganache topping. And even further, we’ve added crushed pecans to the top. Think about it- chocolate on caramel on chocolate? We need some balance guys, even though we love those things. 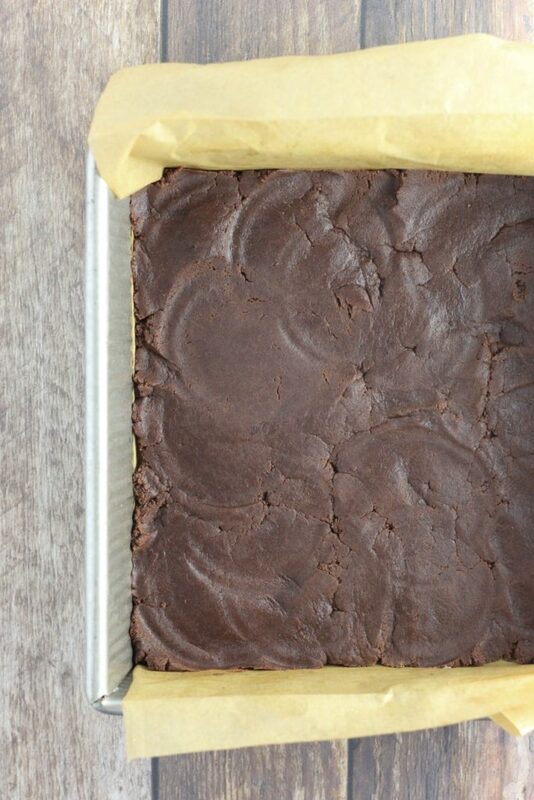 And so another tip here- the instructions say to freeze the bars before removing from the pan and cutting. This makes it MUCH easier to handle. 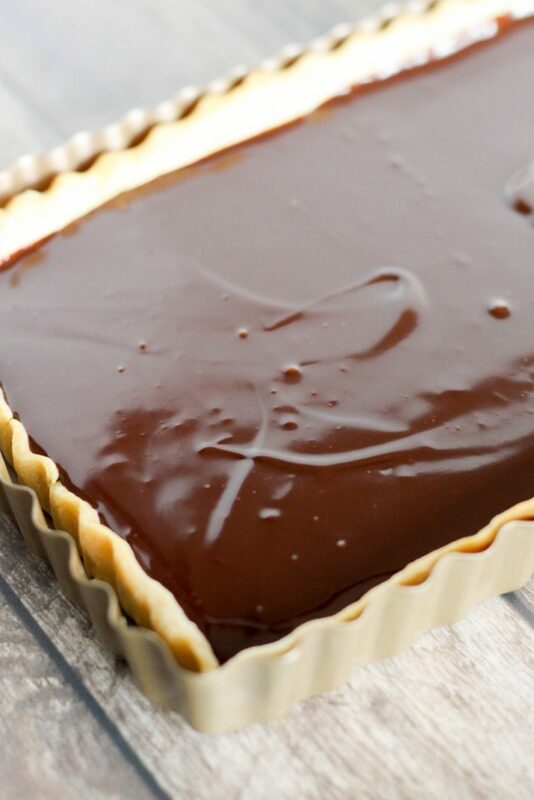 Caramel is sticky and stretchy, and chocolate ganache can be messy as well if it hasn’t fully set. It’s worth waiting, otherwise you’ll have a huge mess on your hands. So it’s the beginning of the week, we made it through Monday, we got this. Enjoy! Preheat your oven to 325 degrees. Generously grease an 8 by 8 inch square pan, and insert parchment paper with overhanging edges. This will help to remove the bars. In a large bowl, beat together the butter and sugar until fluffy. Beat in the vanilla extract. Add in the salt, cocoa powder, and flour, and beat for several minutes until a crumbly dough has formed. 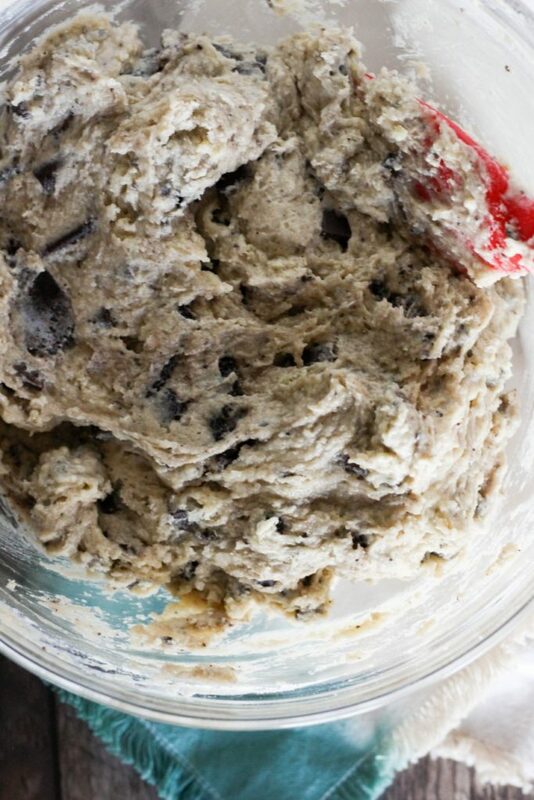 Spread the dough evenly in your prepared pan, and press down with the bottom of a glass for a flat, even layer. Bake for 15-18 minutes, or until the crust looks dry and just slightly darkened on the edges. Set aside. In a large, high-sided skillet (you can use a saucepan as well, but it may take longer), combine the butter, sweetened condensed milk, dark brown sugar, heavy cream, dark corn syrup, and vanilla extract. Whisking constantly, bring the mixture up to a boil over medium-high heat. Reduce the temperature to medium heat, and cook for 10-15 minutes, whisking constantly. The mixture will thicken, and become slightly darker. When you whisk the mixture, it should be thick enough that you can clearly see streaks of the bottom of your pan. Remove from heat, and continue stirring for another couple of minutes. Pour over your baked crust, and let the caramel set for about 30 minutes in the fridge. Heat the heavy cream in the microwave until boiling, and pour over the chopped chocolate in a medium bowl. Whisk until the chocolate is completely melted and the mixture is smooth. Whisk in the salt and vanilla. Pour over the caramel layer, and smooth out using the back of a spoon to cover the caramel layer entirely. 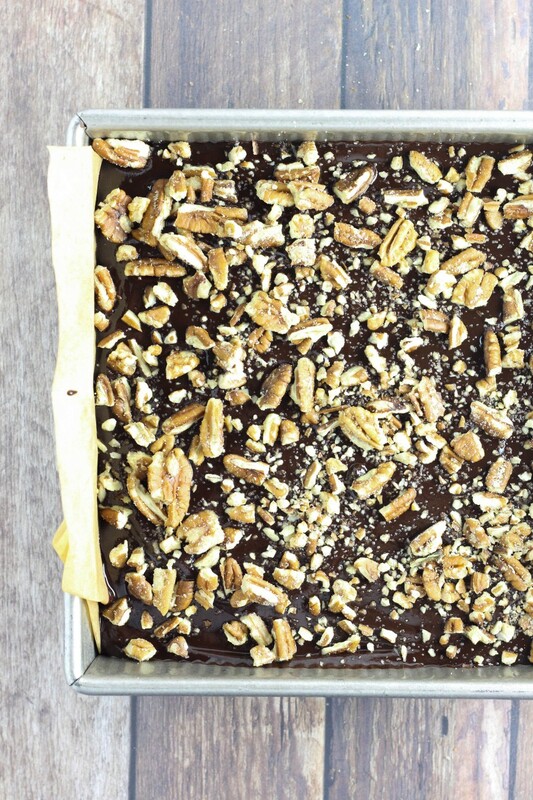 While the mixture is still wet, sprinkle the pecans evenly over the top. Cover and freeze for at least an hour. Run a knife along the edges to remove the bars, and slice to your desired size. These are very dense, so I'd go small. Enjoy! Hey guys! 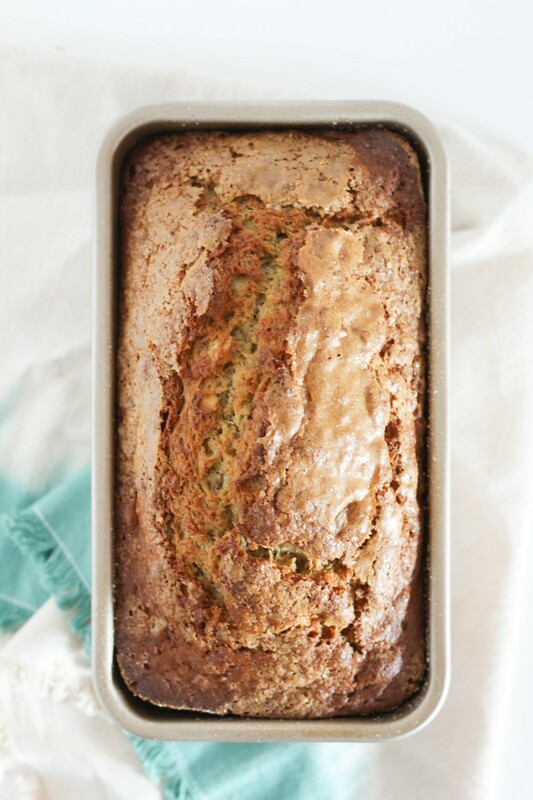 Today I’m jumping back into one of my favs- my Grandma’s Banana Bread recipe. 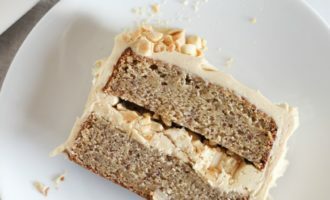 You’ve seen me make a version of this before, Banana Crumb Cake, which you can also find in my book, Sugar High. This time around, we’re adding chopped pistachios and baking it up classic, in a loaf. I’ve got a couple of tricks up my sleeve. I wanted to make this cake a little more moist. 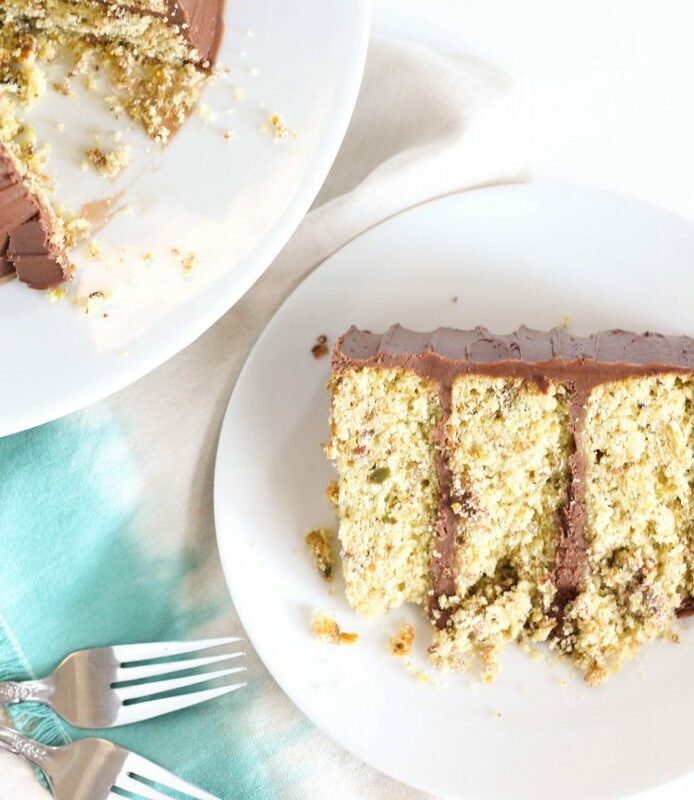 Don’t get me wrong, the original is a great recipe, and it’s a perfect coffee cake. But I wanted to make things a bit more cake-like for the loaf version. So I added some extra mashed banana to give it a little extra. Okay and also, this is my new favorite trick ever guys. You know I bake a lot of loaf cakes, it’s kind of my current favorite. 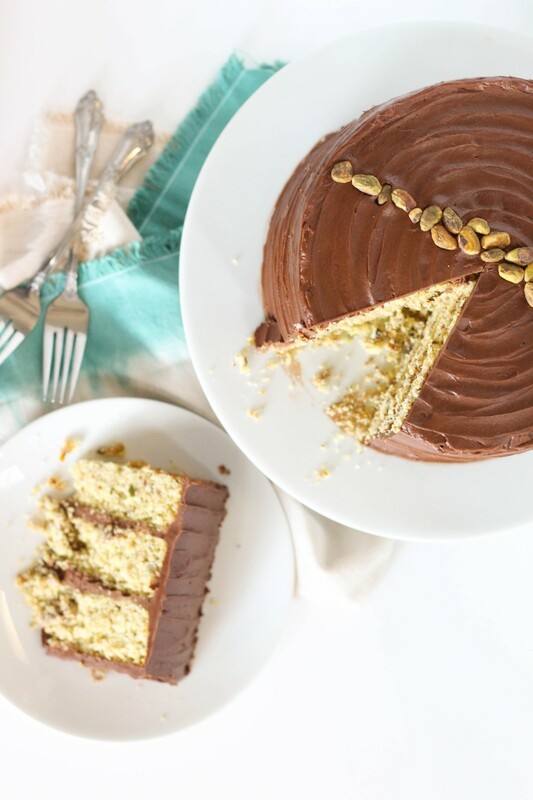 I really love a cake that stands on its own without the need for frosting, and I love the ease of loaf recipes. 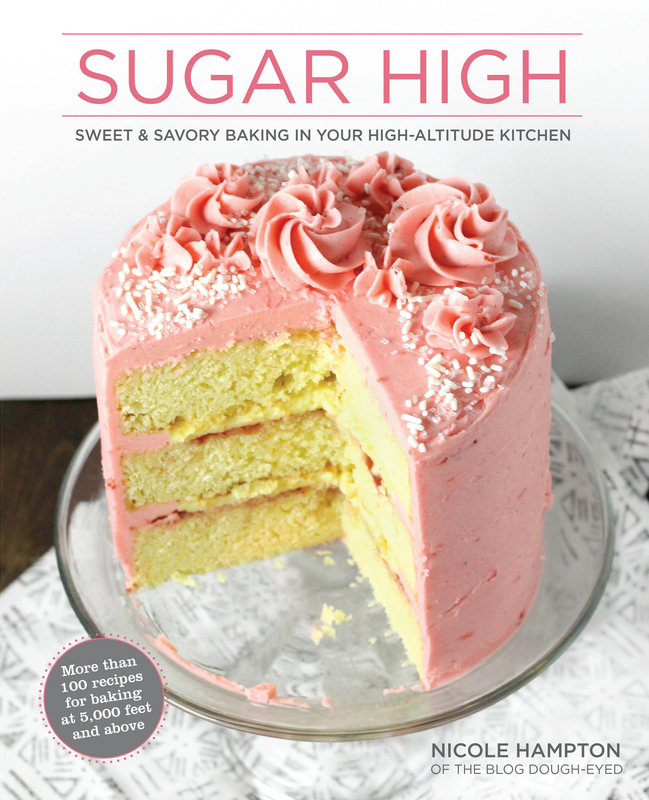 PLUS, I love that sugary, crisp top that you get on many of those cakes, including this one. I’ve seen a lot of info online recently about dusting your cake pans with things other than flour, including just using regular granulated sugar and guys. It’s everything. 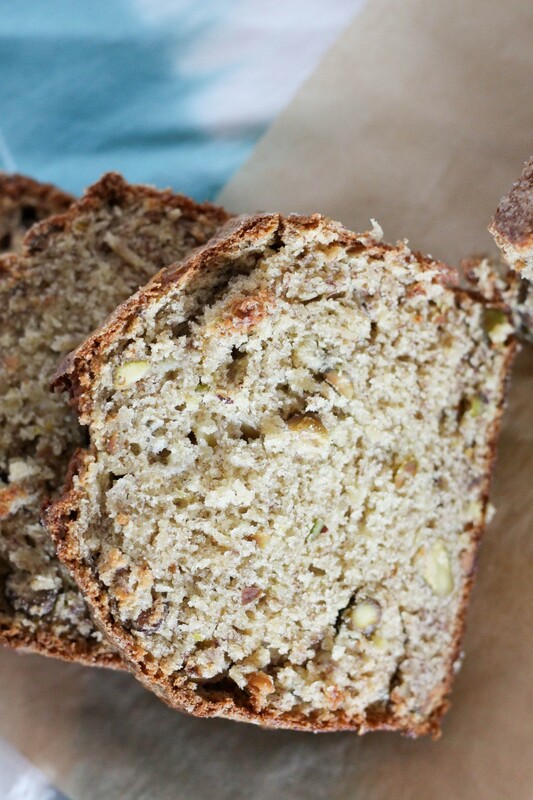 Instead of just getting that sugary top, you can have it all over the edges of your loaf cake. It’s sheer perfection. So ya know, look out for me using this like, idk, all the time from here on out. So anyways, sugary crust, we got it. 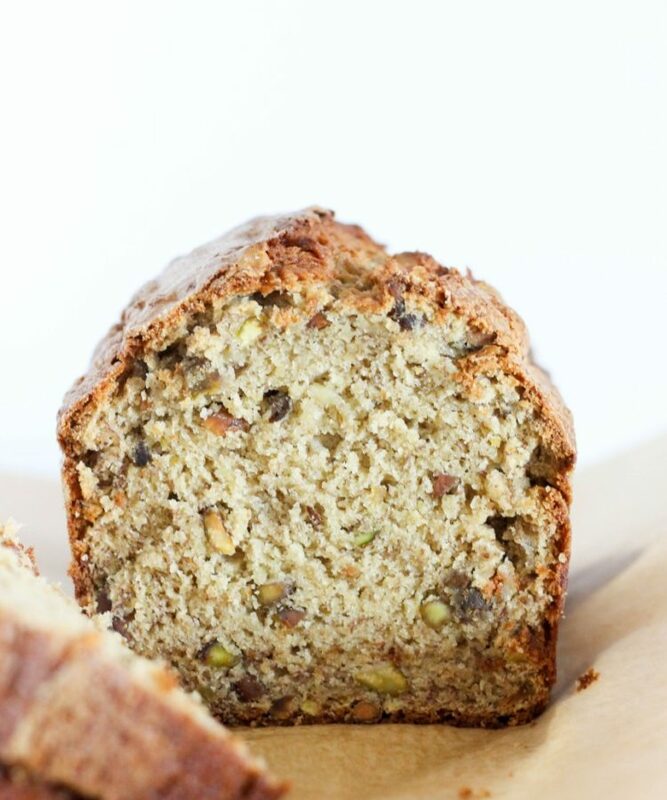 I know the classic option for banana bread is walnuts, but I had some extra pistachios from this recipe last week, and it’s just a nice little twist. Honestly, throw any nuts you’ve got on hand in here, or even a handful of chocolate chips alongside ’em. You know what you like, you got this. But for the record, pistachios are a great choice. 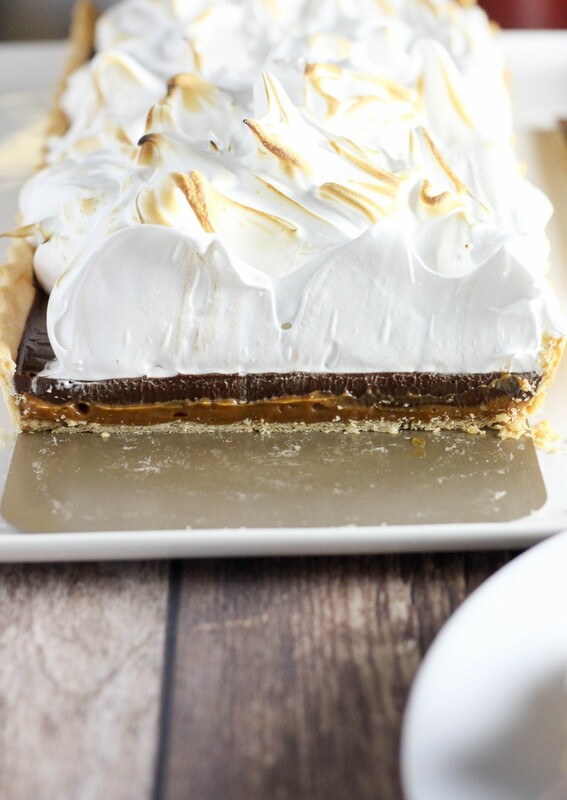 Today we’re all snowed in, it’s been a pjs-all-day type of Saturday, and you can find me curled up on the couch with a slice of this pretty thing. Enjoy! 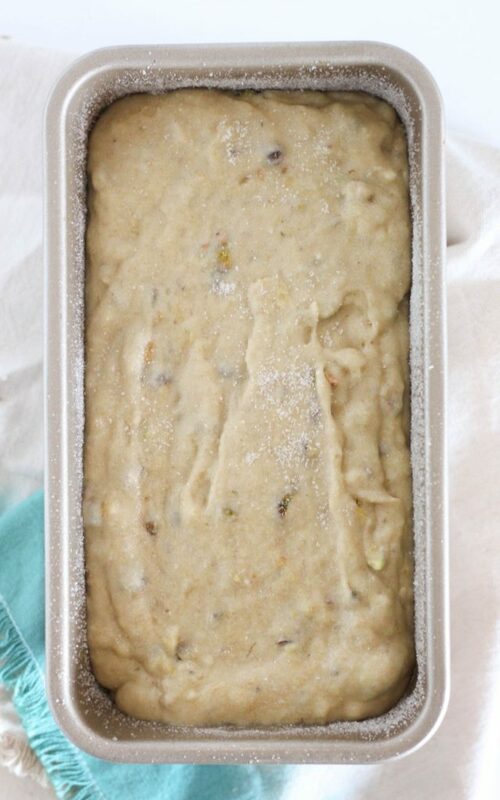 Preheat your oven to 350 degrees, and generously spray an 8 inch loaf pan with cooking spray. Sprinkle the bottom and all sides with granulated sugar, and shake out any excess. Set aside. In a large bowl, beat together the sugar and butter until fluffy. 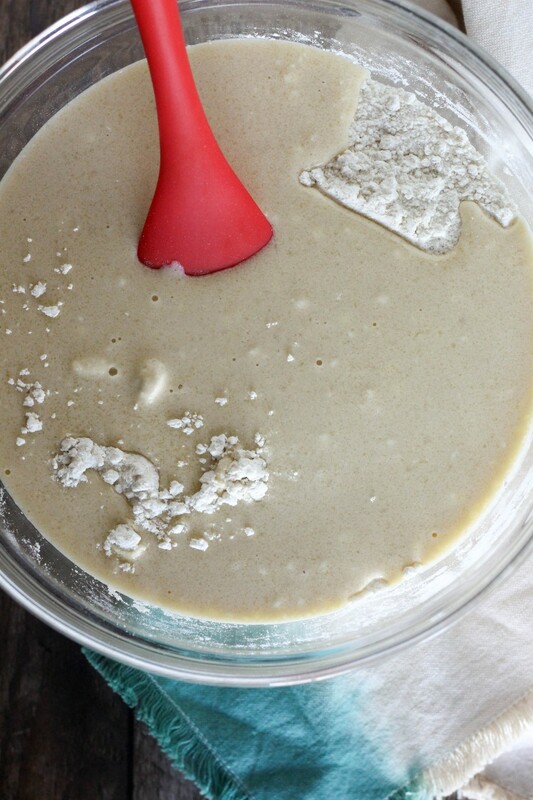 Beat in the eggs, vanilla, and mashed banana and mix until combined. In a medium bowl, stir together the flour, baking soda, salt, and cinnamon. Add the dry ingredients into the wet in three additions, mixing well between each addition, and reserve about 1 tablespoon of the flour mixture. 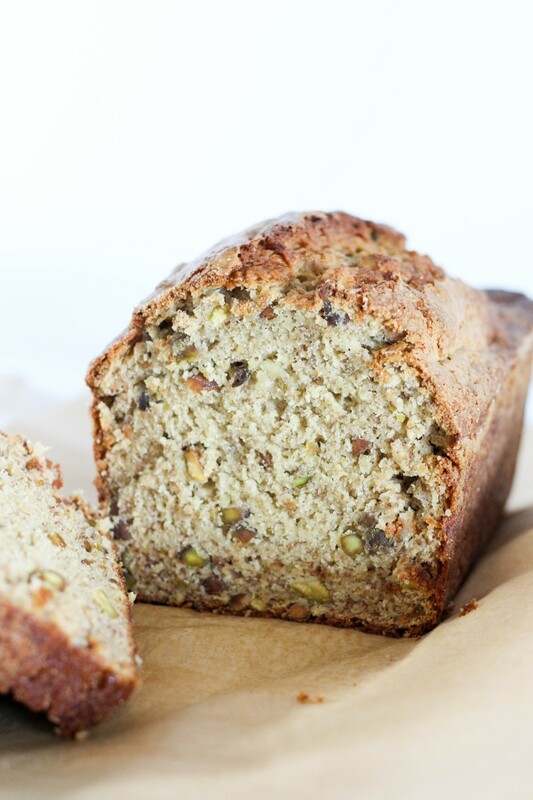 Toss the chopped pistachios in the reserved flour, and fold into the batter. Pour the batter into your prepared pan and spread evenly. Bake for 60-65 minutes, or until a tooth-pick comes out clean. Cool and enjoy! Hey guys! I hope you had a wonderful weekend, and that you’re lucky enough to have this President’s Day off work, just in time to make this cake! It’s my mom’s birthday, and normally I do some kind of chocolate marshmallow situation for her, but this year I’m switching it up. This cake is pure you guys. The ground pistachios give the cake texture and a wonderful flavor, and the fudgey chocolate frosting is too good to be true. Here’s what I know to be amazing about the cake; it’s super easy to whip up, and it actually bakes up without a dome on top- no need to trim before stacking! We’re using the reverse creaming method for the batter today, which is not my norm, but I actually really love the results in this cake. Just be sure to beat for a few extra minutes at the end to reach a light, fluffy batter. And so this frosting. 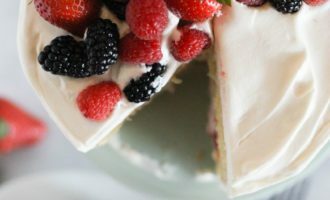 I don’t normally like American buttercream, as most bakers these days seem to agree, but I think it actually works really well for chocolate. 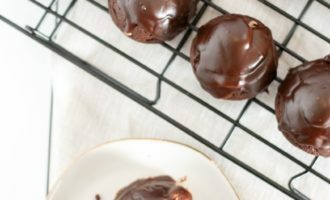 By using dutch cocoa powder and semi-sweet chocolate, as well as a pinch of salt, you don’t end up with something so terribly sweet as a vanilla option. 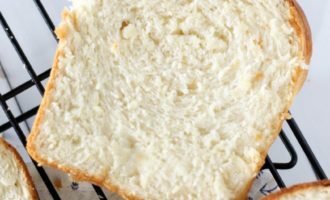 In this recipe, I’ve also added cream cheese for a little tang, and for a super silky beautiful texture. 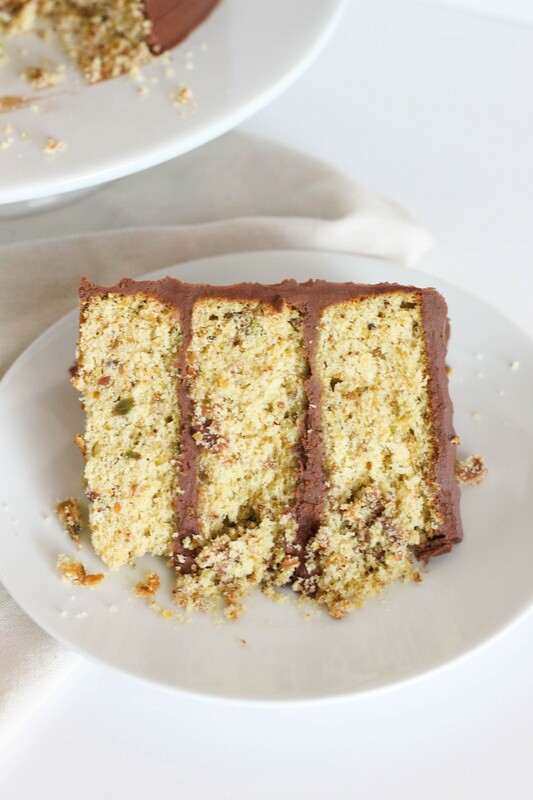 I’ve garnished the cake with whole shelled pistachios, but you can also use ground pistachios or even some pretty sprinkles! 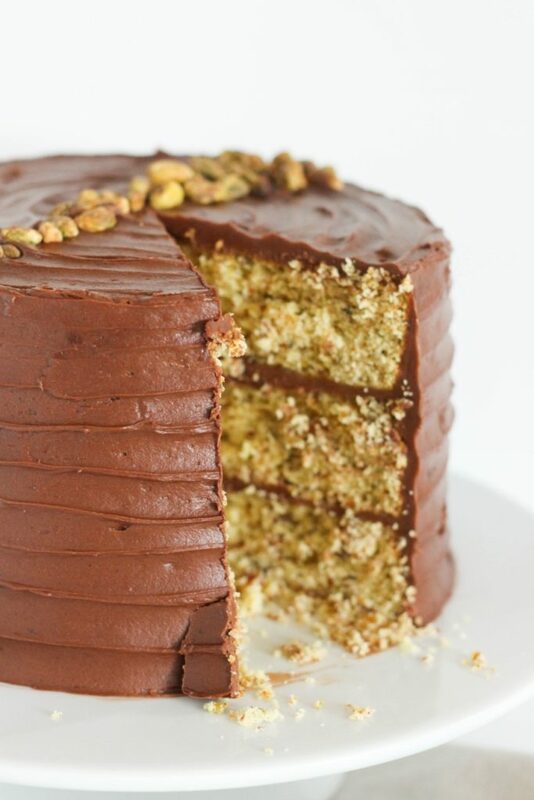 But honestly, the frosting carries this cake to the finish line, don’t even garnish if you don’t feel like it. Preheat your oven to 350 degrees, and grease three 8-inch round cake pans. Set aside. In a large bowl, or the bowl of a stand mixer, stir together the ground pistachios, cake flour, baking powder, baking soda, salt, and sugar. Beat in the softened butter until completely combined, several minutes. The mixture should be crumbly and slightly yellow in color from the butter. In a medium bowl, whisk together the oil, eggs, sour cream, vanilla extract, and buttermilk. Add the wet mixture into the dry in three parts, mixing well between each addition. 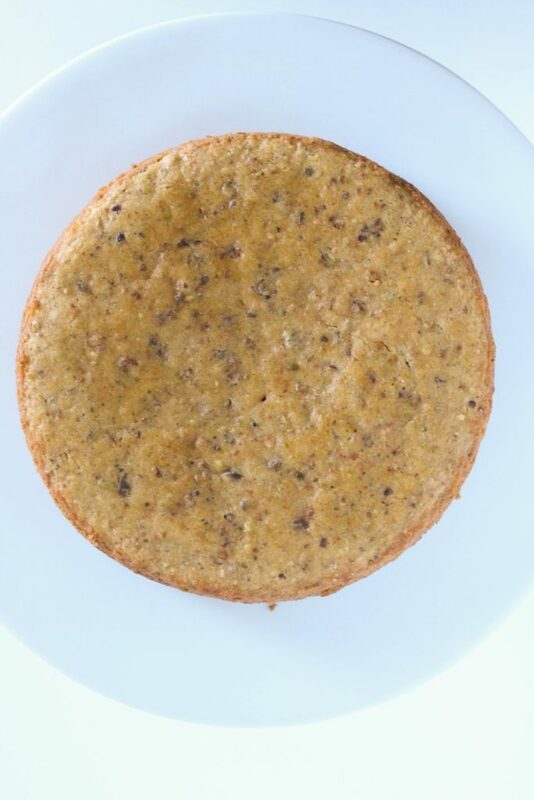 Beat for several minutes after all the liquid has been added until the batter is well mixed, and slightly lighter in color. Spread evenly in your prepared pans, and bake for 30-35 minutes, or until a cake tester comes out clean. Cool completely before removing from pans and frosting. In a large bowl, beat the butter and cream cheese together until combined. Add in the powdered sugar, cocoa powder, and salt, and beat until completely combined and smooth. Add in the melted chocolate, beating until combined. Then add in the heavy cream, and whip for several minutes until fluffy. Frost the cake as desired!